The known galaxy has been forever changed by the Dominion War. Unlikely alliances were forged, and superpowers were both made and shattered. Add in the intervention of seemingly mystical noncoporeal beings, and the scope of the whole thing becomes simply mind-boggling. The Federation has weathered the war quite well, despite devastating losses and the humiliating strike on San Francisco launched by the Breen. Starfleet learned a hard lesson that they were becoming complacent in the field of defense. They redoubled their research into better military technologies after the dust settled. In the years following the defeat of the Dominion, the Federation had several border skirmishes with various powers, eager to try to take a bite out of the weakened Federation. One of these powers was the Sheliak Corporate. These self-important beings thought of all other species as vastly inferior. The Sheliak Corporate got the opportunity they were waiting for to drive the Federation into war when the Tellarites’ home system of Tellar inexplicably translated itself several light-years across the Sheliak border. The Federation tried desperately to reach a peaceful solution to reclaim Tellar, but the Sheliak insisted that it was rightfully theirs, despite the extenuating circumstances. This left the Federation Council little recourse but to declare war. This only served to further shake up the war-weary Federation. This costly conflict was a bittersweet victory, having cost the lives of tens of thousands of Starfleet’s finest. It became clear that the Federation would require a specialized Rapid Reaction Force of starships was needed to defend the Federation’s interests and citizens. 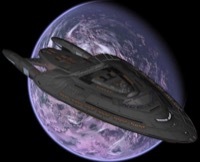 The Phoenix Class Project was initiated to create a starship that would be the first of this new breed of starship, and to be the pioneer of several technologies included in other Rapid Reaction Force starships. 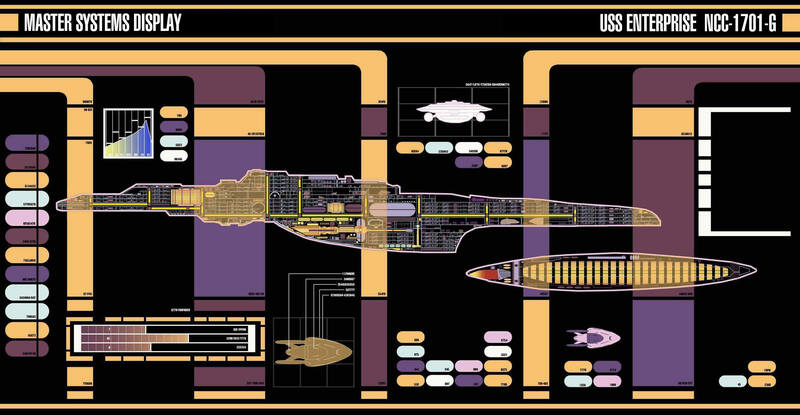 Replace Pelagic, Sovereign, and Prometheus Class starships as the primary instrument of Federation deep-space defense. Ensure Federation security through rapid reaction to threat forces with deployment of the Quantum Slipstream Drive. Provide a mobile platform for field deployment of new equipment produced by the Voyager Advanced Technologies Project. Provide autonomous capability for full execution of Federation policy in outlying regions. The Phoenix Project began in earnest in 2389, shortly after the start of the Sheliak War. The project was dealt several setbacks early on, especially in the propulsion department. Starfleet R&D encountered major difficulties in fitting both a standard warp drive and an experimental slipstream drive into a single spaceframe without either exceeding the volume/mass requirements, or severely restricting the remaining volume available. Designers were left at an impasse until they had an epiphany: install a single hybrid drive instead, one capable of generating subspace fields for both warp and slipstream travel. After four years of concerted effort, R&D finally produced a viable hybrid propulsion system for the Phoenix Class. 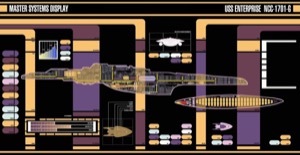 The USS Phoenix (NX-87432) began accelerated production in 2397 inside of one of the new pressurized drydocks at the Utopia Planitia Fleet Yards, with the keels of the Enterprise (NCC-1701-G) and Leviathan (NCC-88326) laid four months later. In 2400, the Phoenix began its maiden voyage around the Sol System, and tested its slipstream drive on a short jaunt to the neighboring Alpha Centauri System. It then moved on to the scheduled stress tests of the slipstream drive, flying to the far reaches of Federation territory. It was nearing twelve hours of flight time when the signal from the Phoenix mysteriously vanished. Salvage teams sent to the Phoenix’s last known location discovered an unrecognizable field of debris. Subsequent analysis of the fragments determined that the ship had experienced unexpectedly severe subspace stress. It was deemed that the Phoenix was destroyed due to a catastrophic slipstream drive failure. Production on the two other hulls was halted until the cause of the breakdown was pinpointed. Ultimately, engineers determined that an inherent, irreversable flaw in the drive was the cause, and that the drive could only safely run twelve hours on slipstream, even on low speeds. Despite this setback, the project resumed construction only a few months later. The Enterprise launched in January 2401, the eighth starship to bear the name. The Leviathan was still eight months away from launch, held up by contract disputes with Dyson Corporation, a major organization that was producing several key parts of the Phoenix class. Fears about the stability of the slipstream drive were eased tremendously with the safe first flight of the Enterprise-G during her maiden voyage. Notice: This technical manual is intended for general informational purposes only, and not as a primary reference for Engineering operations. Information contained within this document may be subject to Starfleet Intelligence regulations, according to Section INTEC 34-5G. Any data contained herein may have been altered or fabricated to confuse and confound current and potential Threat intelligence operations. Starfleet personnel should consult their superior officers to obtain any classified information cleared for their security level.